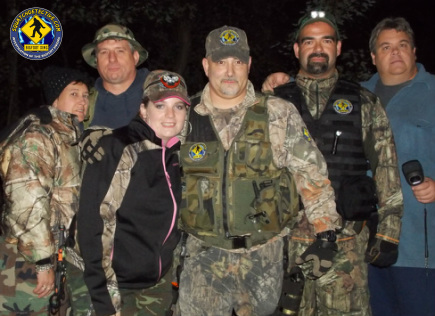 In September through November, 2013 the Squatchdetective Field Investigation Team initiated several excursions into the Adirondack Park, Eastern New York and Western Vermont. 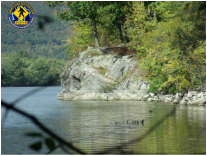 During the first excursion in the Adirondack Park of the season, Steve and Stacey had a rock thrown at them in the base camp. It was heard descending through the trees and leaves and landed some 20 feet in front of them with a distinct thud. The rock was easily retrieved and examined. 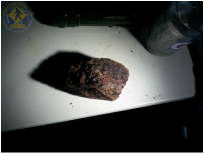 No hair was found on it and it weighed approximately 2 lbs. and was a little smaller than the size of a baseball. After we called out to it, it leisurely (and I mean very leisurely) walked towards us, and then hooked a turn into the brush and disappeared. 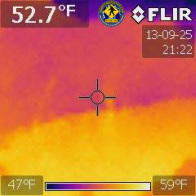 Total observation time was about 4 minutes and the majority of the team got to look at the FLIR as it happened. Looking forward to the roads we must travel in 2014! 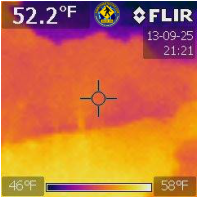 The second interesting thing to happen to us was while visiting an area in Western Vermont, we caught a FLIR thermal image of a solitary upright figure walking in a pretty inaccessible area, especially for the time of night. We were at a tactical vantage point being able to see for a great distance and having the high ground. Looking at the FLIR shot in daylight. We were very excited to get the images and since it was our first time with thermal captures, there is room for improvement, but now we know how to make our pictures clearer and easier to identify. Only through constant trial and error will we perfect the use of this tool. While we feel it will not conclusively prove the existence of the creature, it definitely will assist in some understanding of behavior patterns. In many respects 2013 was a year with significantly reduced activity, however the evidence we gathered was nonetheless exciting, having yet another track find and some FLIR images...FINALLY! 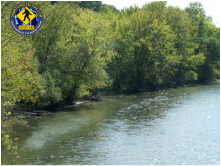 We look forward to 2014 bringing us exciting new challenges and cases, and hopefully the evidence to draw this mystery closer to an end!